Do note that that the AuxPow or merged mining support comes with a hardfork for the DOGE, so you will need to update your wallet to continue using it after block 371337, so if you still haven’t updated to version 1.8 of the Dogecoin wallet than it is time to do the upgrade. Have in mind that the update will require you to reindex the blockchain and that can take some time to complete. 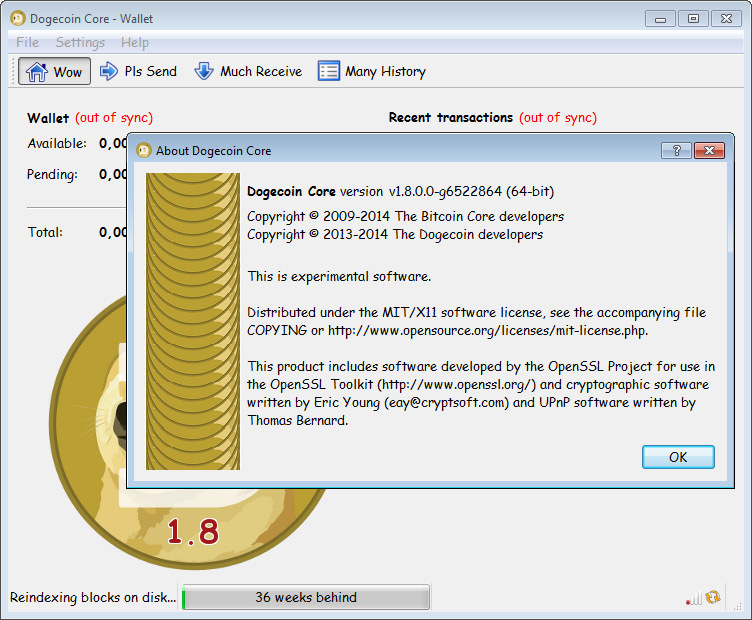 There is now an official release of the Dogecoin Core 1.8 available that adds AuxPow support required for the upcoming merged mining support with Litecoin and why not other Scrypt crypto currencies. Starting with block 371337 the Dogecoin network will accept AuxPoW blocks from miners of other chains, according to calculations this should happen around September 12th. This is a mandatory upgrade that you need to install if you wan to be able to continue using your wallet. Do note that after installing it you will have to reindex the blockchain, so it will take some time before the wallet balance appears again, also a wise idea to have a backup of the wallet.dat file before running the upgrade.